Nominations for our leadership elections are officially open, so we’ve reached out to previous SU Officers to help spread the word. Over the next few weeks we’ll be posting one-to-one interviews to give you an insight into what it’s really like to campaign! Nobody knows the Officer experience better than re-elected president of 12/13 and 13/14, Giulio Folino. So Giulio, what was your experience of campaigning like? It was kind of a whirlwind. Going everywhere, visiting all the campuses, talking to hundreds of students, showing up early to do lecture shouts and finding creative ways of reaching out to students! I was going to the bar and chatting to students there, going to so many different societies, clubs and visiting as many of the sports teams as possible. 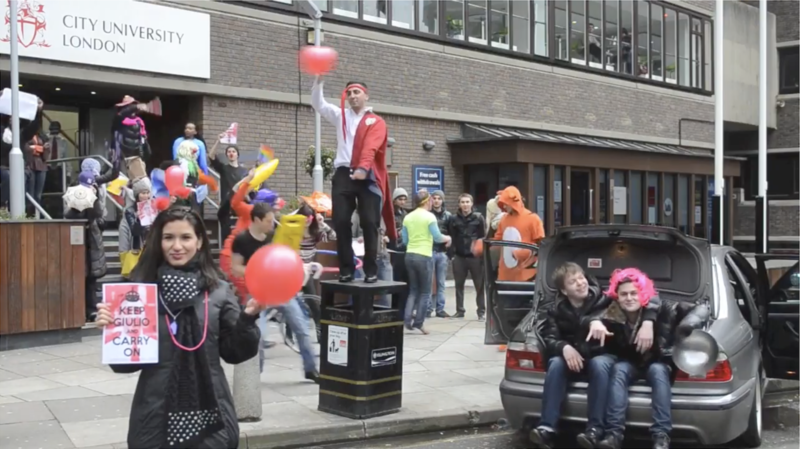 Some of whom I knew anyway as I was an active member of some societies, LGBT society for example. I just thought it was great to meet such a different range of people. It was really incredible how many different types of people were at City. Obviously before you do it you think “oh my god, what am I doing?” but you’ve just got to go for it. So, I really went for it! Say you hadn’t been elected do you still think you got a lot out of campaigning? Yeah, I think so because I actually ran in the two elections before and didn’t get elected, so I just kept going. I didn’t win until the third time and it would have been my last shot as I was finishing Uni anyway. It definitely really built my confidence, helped with my public speaking skills and it really helped me talk to strangers. When you’re in that campaigning mode, it’s like bouncing off other people’s energy. It made me feel really positive about speaking to so many people and it was so good to hear other people’s experiences. I got loads of manifesto ideas through speaking to lots of people as well because students from different schools have different experiences, different grievances and different issues that they want to be solved. So before even campaigning I would get different viewpoints about how people thought about stuff and then kind of incorporate it into my manifesto, so that it was something that represented what people wanted. Yeah, you have to kind of get yourself back up again and just keep going. I thought “I’ve just got to keep going until I win”! It was worth it in the end. Even if I hadn’t have won it was worth it anyway as I got to meet so many people and so many other candidates who were also campaigning. 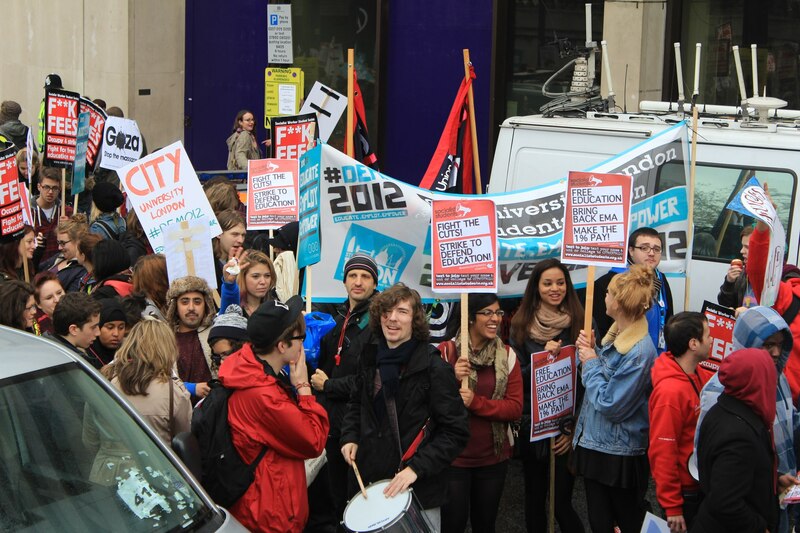 Giulio's amongst the crowd, representing City students at the Demo 2012! How has it helped you since? I’ve managed to take those skills and move forward with them in interviews, particularly in dealing with stakeholders. I think it’s an invaluable experience, just to say that you’ve ran a campaign from scratch. You know, you’ve got to think of it from a marketing perspective, you’ve got your writing skills in your manifesto, you’ve got verbal communication, you’ve got persuasiveness skills, so it’s absolutely worth it even if you don’t win! Not many people can say that they’ve taken part in an election. Whether you’re elected or not you can still say X amount of people gave me their vote and that was a result of all of this campaigning material I produced and all these things I did. What would you say to students who aren’t so confident? I think you tend to build the skills throughout the campaign. Once you start throwing yourself in a little bit, once you start meeting people… I mean it’s like practicing anything, you just get better at it. You just get better at getting out of your own comfort zone. I used to have the worst stutter. I couldn’t even say a sentence without stuttering uncontrollably when I was fourteen. I did public speaking to help me get over that and in a similar way, I kind of continued that through to my campaign. I was nervous about things and I didn’t have confidence back then but I did what I could to break through it and improve on it. Why would you encourage others to campaign? If you have specific issues that you want to tap into, if you’re political generally or if you have certain causes that give you another reason to want to campaign. Whether it’s against poverty, whether it’s human rights, whether it’s racism, you know all of that stuff. If you channel that into running your campaign, I think that’s really, really positive. I think one thing that really spurred me on was that we needed to have LGBT issues represented here at City, so yeah that’s why I really went for it. I would say just go for it. You’ve literally got nothing to lose, like actually nothing to lose! You’ve only got friends to make and skills to gain from running an election, that’s what I’d say. Thanks so much for sharing your wise words, Giulio!